From quintessential safaris in world-renowned wildlife areas to a blissful stay on Lake Malawi, this African honeymoon is the perfect combination of adventure and tranquillity. And what better way to begin your new life together than with one of Africa’s greatest natural spectacles. A visit to the thundering Victoria Falls, or ‘the smoke that thunders’ as it’s known to the locals, kicks off your honeymoon with the opportunity for romantic sunset cruises and birdwatching tours. You’ll then find yourself in the Lower Zambezi where expert guides will show you crocodiles, lions and elephants; and later in the South Luangwa where walking safaris are the order of the day. At the end of your journey you’ll exchange the drama of the bush for the peaceful shores of Lake Malawi. Staying at a private island resort perched right on the lake’s edge, you’ll be able to enjoy majestic views across the landscape from the comfort of your room. The perfect ending to an authentic African safari. Price includes international and domestic flights, park fees and full board at Tongabezi Lodge, Chiawa Camp, Tena Tena and Kaya Mawa. Based on two people travelling. Overnight flight from London Heathrow to Johannesburg, before taking a connection flight to Livingstone. After landing in Livingstone, you will be met and transferred to Tongabezi Lodge where you will be just upstream from the thundering Victoria Falls. Stretching across the border between Zambia and Zimbabwe, this epic waterfall is not only a World Heritage Site but one of the Seven Natural Wonders of the World. Which is easy to understand once you see the mile-long string of cascades plunging across the cliff face, causing immense clouds of spray that rise up to 400m. Romantically set on the banks of the Zambezi River, Tongabezi is the perfect base for exploring both the falls and its surrounds. Sunrise and sunset river cruises, bird walks and white water rafting are all on offer, but if you’re looking for something extra special for your honeymoon, why not opt for a helicopter flight over the falls – the most thrilling way to take in the cascades. Leaving the Victoria Falls behind you set off to explore one of Africa’s most pristine wilderness areas – the Lower Zambezi. Dominated by the mighty Zambezi River, rugged escarpment, lush woodland and an abundance of floodplains and oxbow lagoons, it’s no wonder the park has a thriving wildlife population that includes 50 different mammals and over 400 different species of bird. Famed for its large elephant herds, the park also boasts healthy numbers of lion, buffalo, leopard and impala amongst many others. As a guest at Chiawa you’ll be able to choose from a variety of activities that range from game drives and bush walks to boat safaris, tiger fishing and canoeing. All led by exceptionally knowledgeable guides. 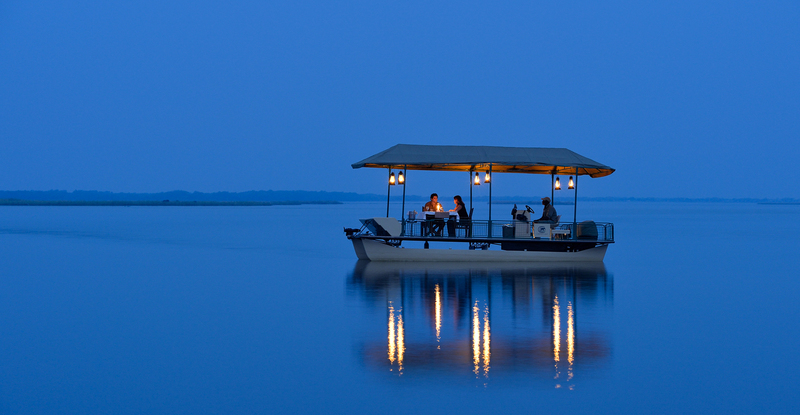 Your next port of call is Zambia’s best known safari destination, the world-renowned South Luangwa National Park. Sprawling for 9,000 square kilometres and dissected by the Luangwa River, this immense wilderness boasts a staggering concentration of game. You can expect encounters with a variety of wildlife including leopard, lion, Thorneycroft giraffe, Cookson’s wildebeest and Crawshay zebra, as well as large herds of buffalo, hippo and elephant. The birthplace of the walking safari, exploring on foot is still one of the finest ways to experience all South Luangwa has to offer – especially the smaller aspects of the bush. Day and night game drives are also the menu, whilst visits to local villages is a great way to learn more about the culture of the region. Enjoy a three-night stay in an exclusive camp within the remote and game-abundant Nsefu Sector. After a series of wildlife adventures, it’s now time to jet off for some well-earned rest and relaxation. Flying into Likoma Island, you will be met and escorted to your private island resort overlooking the crystal-clear waters of Lake Malawi. Panoramic views, private terraces and direct access to the water ensure a blissfully laidback experience. But if you’re still feeling active, walking or biking around the island is a wonderful way to soak up the scenery and meet the friendly locals. The balmy waters around the lodge are perfect for swimming and snorkelling, whilst water skiing, kite-surfing, tube riding and fishing trips complete the menu of activities on offer.